Autumn is such a pretty time of the year. 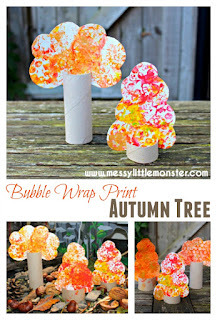 The changing colours of the Autumn leaves inspired this bubble wrap Autumn tree craft. 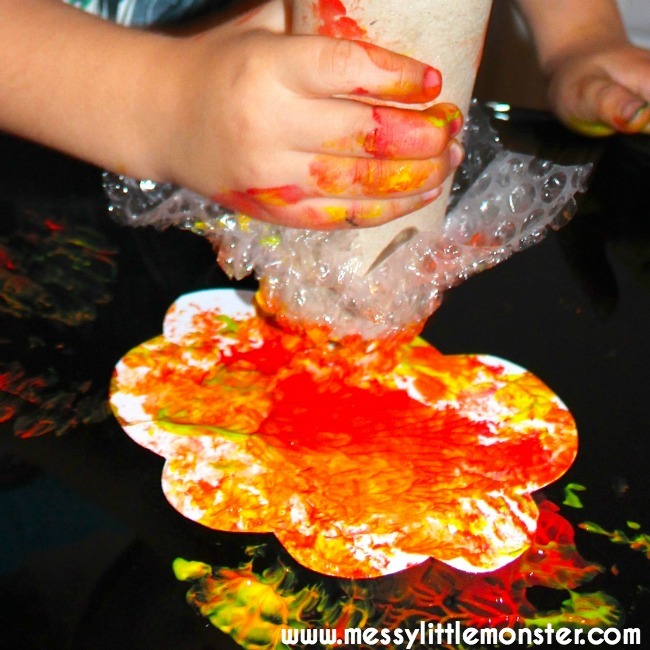 Printing with bubble wrap is such a fun art process and simple enough for toddlers and preschoolers to enjoy. What's even better is that this simple tree craft can be used to enhance small world play. Before beginning the activity you will need to make a stamp to print with. Cut a piece of bubble wrap that is slightly bigger than the end of a cardboard tube and then use an elastic band to attach it to the tube. 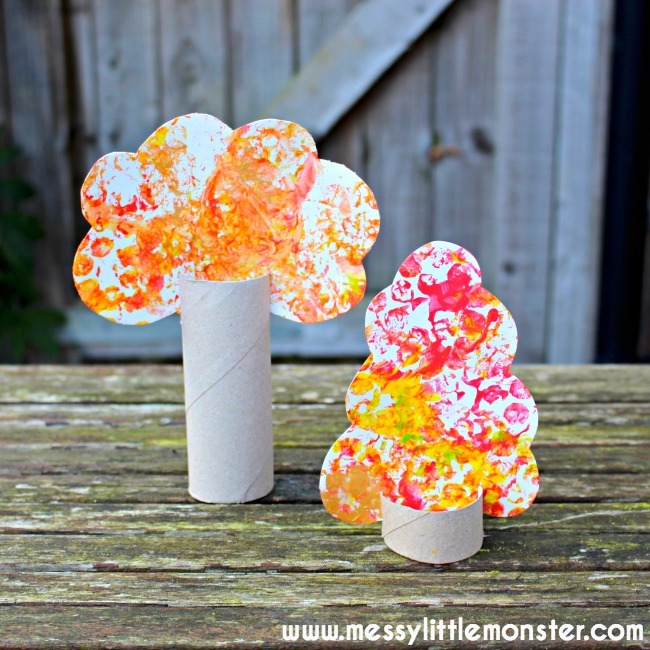 Squirt some red, yellow and gold paint onto a plate and use the stamp to print onto the card tree shapes. As you press the stamp down onto the card you should be left with lots of interesting patterns made by the bubble wrap. Harry and Daisy mixed the colours together on the plate which looked really effective. Some of our trees were left so you could see the pattern from the bubble wrap and some of them has the paint swirled about on them with the stamp. 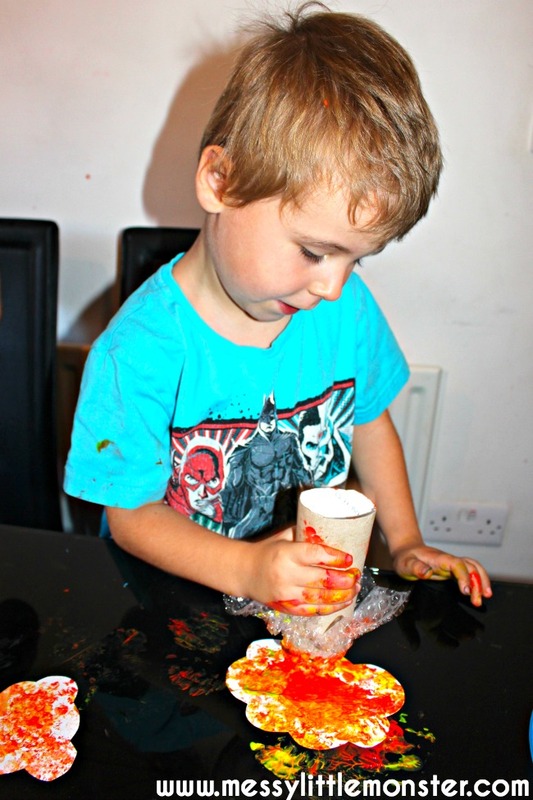 The children both had lots of fun experimenting with the different patterns they could create. Of course daisy had to have two stamps! 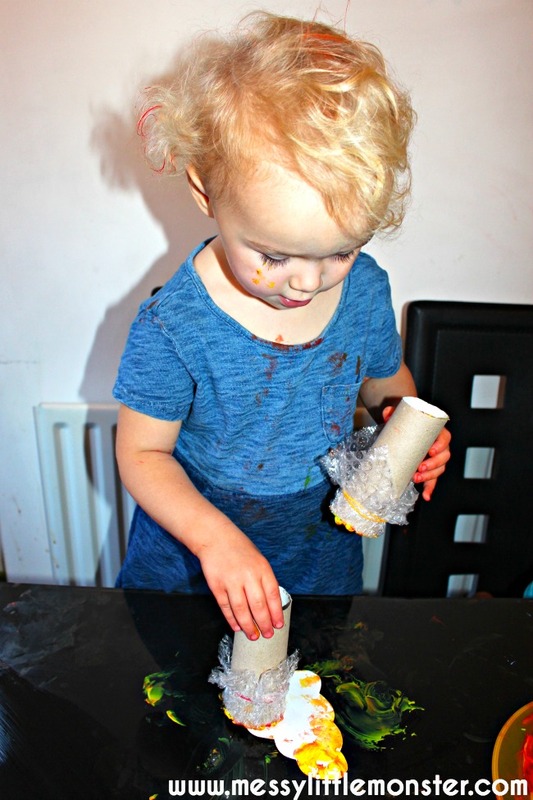 Whilst the paint is drying cut up some cardboard tubes to make the trunks for the trees. 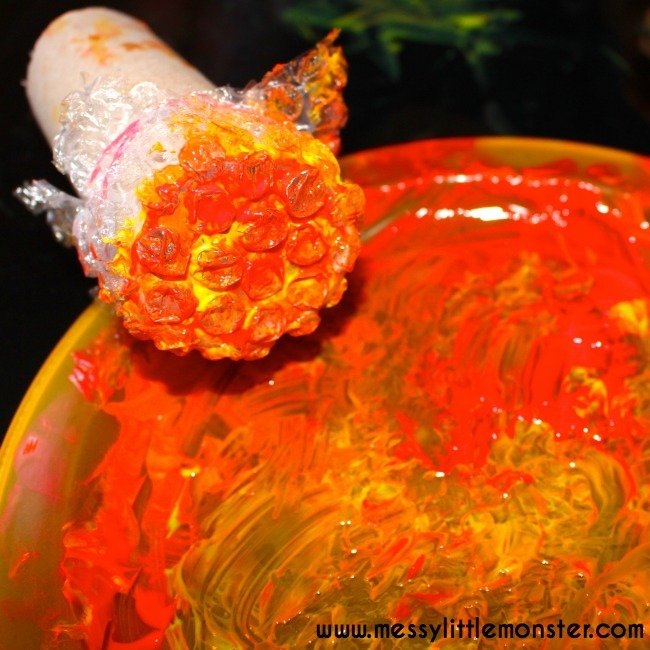 Make two small cuts on each tube to slide the painted tree shapes into. We made our tree trunks a variety of sizes. 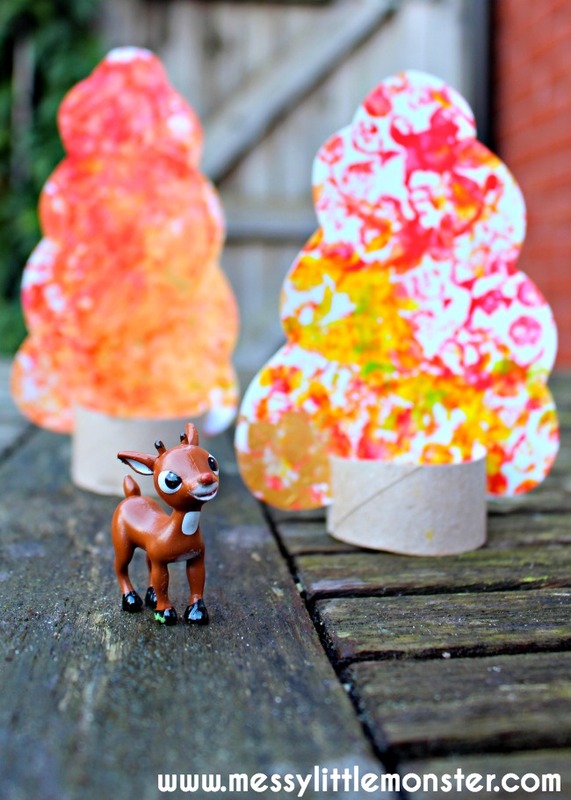 We added our Autumn trees to our Autumn nature collection. 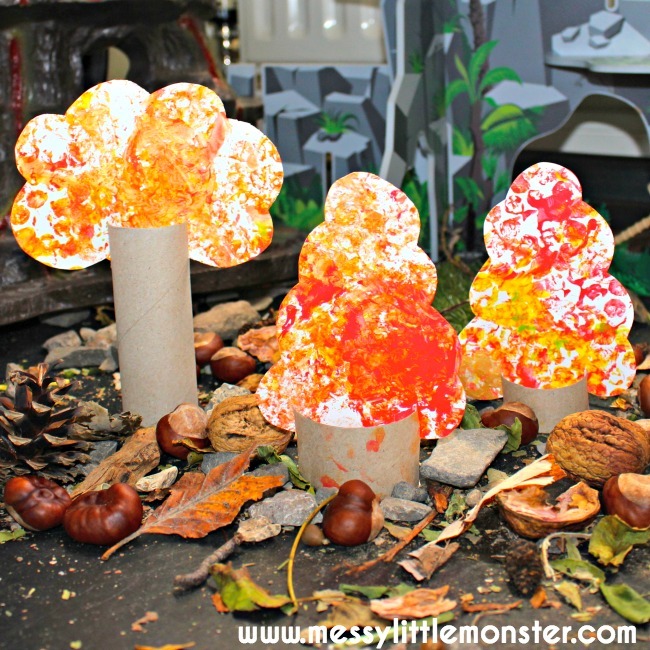 The trees are a perfect size to be used for small world play. The children have loved setting up their own woodland of trees and it has already been visited by animals, dinosaurs and fairies! Thank you for joining in with this months process art challenge.